Ansal The Fernhill, Sector-91 Gurgaon: Ansal Api has launched a New Project "The Fernhill" offering 2 and 3 bedroom apartments in prime location Sector 91, with unique features at affordable price starting from just Rs 2645/SQ.FT. Land Area : 14 Acres. 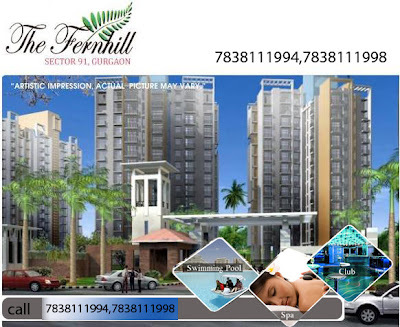 Apartment Type : 2/3/4 BHK Apartment. 2 BHK : 1348 SQ.FT. 2BHK + Kids Room : 1618 SQ.FT. 3 BHK : 1877 & 1880 SQ.FT. 4 BHK : 2321 SQ.FT.